You can build a brighter future. A decent, affordable home is an investment that lasts for generations. We’re talking about the strength, stability, and self-reliance that comes through homeownership. The need for affordable housing is immense, and the lasting impact homeownership can have on families and individuals is undeniable. Habitat for Humanity homes are not free gifts – each family who partners with Habitat is making a personal and financial investment in their future. Contact us if you or someone you know is in need of decent, affordable housing. We’ll explain the process and explore the homeownership options available. Every family needs a strong foundation to build a brighter future. At Habitat for Humanity East Central Ohio, we believe that every one of us deserves a decent and affordable place to call home, and that home becomes a launching point for a brighter future. At Habitat for Humanity, we partner with hard-working, low-income families to help them build a better life for themselves and their loved ones – because we know that decent, affordbale shelter offers strength, stability, and self-reliance. After each home has been built or renovated, it is sold with an affordable, no-profit mortgage and an affordable monthly payment. As Habitat homeowners make their mortgage payments, they are helping to complete the homes of future homeowners – and the cycle continues. This is how Habitat works. At #HabitatforHumanity, we have seen firsthand how critical housing is to families and to communities. We realized from the beginning that when we build structures, we are also building strength, stability, and self-reliance. To be eligible to purchase a home with Habitat for Humanity, potential homeowners must meet these three areas of qualification. You must have a steady income. You must have a need for housing. A family must be currently living in sub-standard housing. Habitat works each day to eliminate poverty housing in the local community. You must be willing to partner with us. A family must have the willingness to partner with Habitat by investing Sweat Equity in their home and the homes of other partner families. *Specific income guidelines will be discussed once a family has submitted an application. Habitat does not discourage anyone from applying for our homeownership program. However, please note that in addition to meeting Habitat’s monthly income and debt requirements, an applicant must not have filed bankruptcy or had property foreclosed on within the past two years. All court fees, fines, time served, community service, etc. must be fully satisfied and any civil judgment or tax lien paid in full and satisfied prior to being accepted into the homeownership program. We’re offering a hand up, not a hand out. Habitat for Humanity homes are not given away. When a family or individual partners with Habitat, they invest sweat equity by building or renovating their home and the homes of others. Each family also participates in home maintenance and financial literacy courses, and much more. In short, the path to homeownership isn’t easy, but owning your own decent, affordable home is very much worth the investment. We rebuild the past to help you shape your family’s future. Build-A-Home | Hardworking families and individuals may purchase a newly constructed home. The future homeowner participates in the construction process, sweat equity, and Habitat homeownership classes. When completed, the home is sold with an affordable, no-profit mortgage. 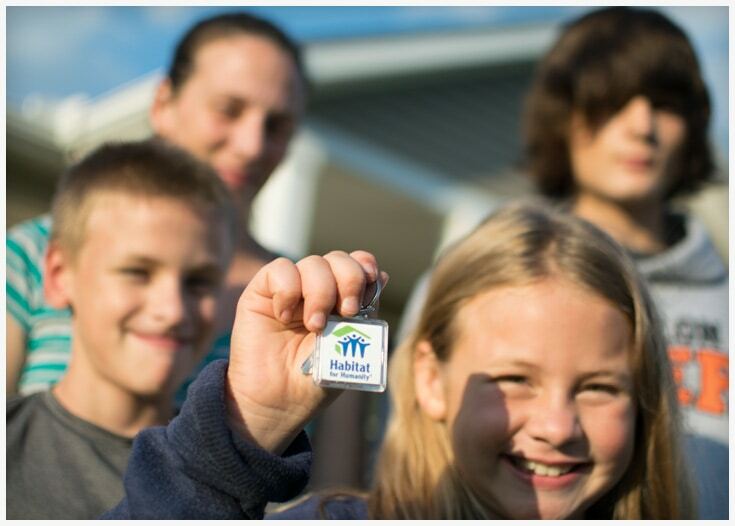 Hardworking families and individuals may purchase a home that’s been renovated by Habitat. The future homeowner participates in the renovation process, sweat equity, and Habitat homeownership classes. When completed, the home is sold with an affordable, no-profit mortgage. Hardworking families and individuals may purchase a home already renovated by Habitat. The future homeowner provides the required down payment and the home is sold with financial assistance through Habitat. Families and individuals who can acquire their own financing and down payment may purchase a home already renovated by Habitat. Through our partnership with families and individuals, we equip future home buyers with the strength and self-reliance they’ll need to be successful homeowners. Families who are accepted in the Habitat partnership will be required to complete a number of sweat equity days. Click here to learn more about sweat equity and take a look at a few of the ways this important investment of time is made. Being involved in the process of building or renovating Habitat homes – including your own. Classes involving financial education, hands-on maintenance training, future planning, and more. Lending a hand at Habitat for Humanity ReStore, in the warehouse, or in the Habitat ministry offices. When you receive the keys to your new home, you will quickly begin realize the benefits of safe, decent, and affordable housing. Provide your family with a safe, stable home environment to return to at the end of the day. We work with you to ensure that your new home is affordable so you can use your resources effectively. Your new home will be an asset and a legacy – something you can pass down to your children. Have a question about homeownership? Let us help.